By providing a focal point, this fireplace "anchors" this outdoor room. Los Angeles Times in Los Angeles, CA. 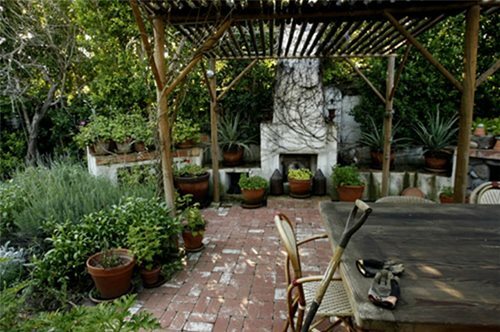 An outdoor fireplace should be located in an area that has enough space for people to sit and relax. The Green Scene in Northridge, CA. This perspective drawing shows the space necessary for a large outdoor fireplace (18' x 25'). 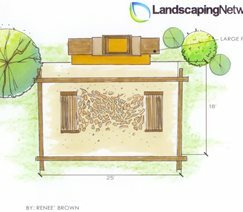 This perspective drawing shows the space necessary for a small outdoor fireplace (12' x12'). 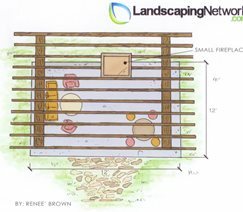 The location of a backyard fireplace will have an impact on the overall atmosphere of your yard. Placement will also determine how often a fireplace gets used. 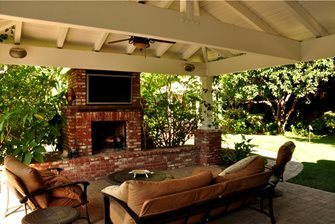 Outdoor fireplaces are often used to "anchor" an outdoor living room. It is also popular to place a fireplace near an outdoor kitchen area. Because of its size, an outdoor fireplace will become a focal point in your yard, so think about where this type of feature will be enjoyed without detracting from other focal points or views. Commonly enjoyed from the front side only, an outdoor fireplace can be located against a wall, along a fence or in a corner of a yard. Some fireplaces are free standing at the edge of a patio, some are built into a retaining wall or are attached to an outdoor kitchen, while still others are built next to a patio cover or pergola. 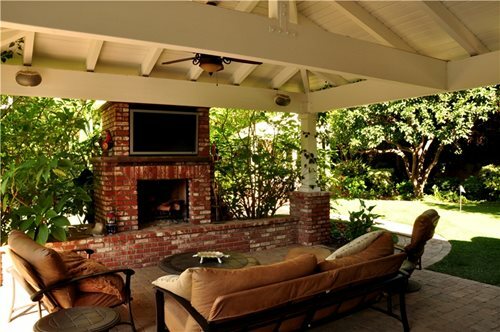 However, make sure you have ample space for patio furniture or built-in seating in front of your fireplace. For a small fireplace you will need at least a 12 foot by 12 foot patio, for a large fireplace you will need at least an 18 foot by 18 foot patio. The first step in deciding where to place your fireplace is to contact your local city planning office. Zoning regulations will dictate how close a fireplace can be to existing structures. You may also encounter property line setback guidelines. If you are placing your fireplace near a patio cover, find out how tall the chimney must be in relation to the top of the structure. The second thing to consider is privacy. Fireplaces are great for creating an intimate and relaxing setting outdoors. Consider placing your fireplace with its back to neighbors so that the fireplace itself acts as a privacy screen. While attempting to create privacy, be careful not to block views with your fireplace. You wouldn't want to look out your door and have a fireplace stand between you and a gorgeous mountain, sea or city view. You should also take into account your property's prevailing wind direction. Place your fireplace in a location where it will act as a wind break. This will create a calm and comfortable place in front of the hearth where you will be able to relax by the fire.